These delicious recipes from our “Healthy Holiday Eating” event last Saturday were provided by our partner in the event – Stacey Weber, personal chef and owner of EAT Cafe in Phoenix. Blend all crust ingredients in a food processor until you have a thick, uniform crust texture. Scoop dough out and mold to parchment lined muffin pan creating a bowl shape. Place crust in the freezer while you prepare the filling. Blend all filling ingredients in a high speed blender or food processor until you have a creamy uniform consistency. Remove muffin pan from the freezer and scoop filling into your crust. 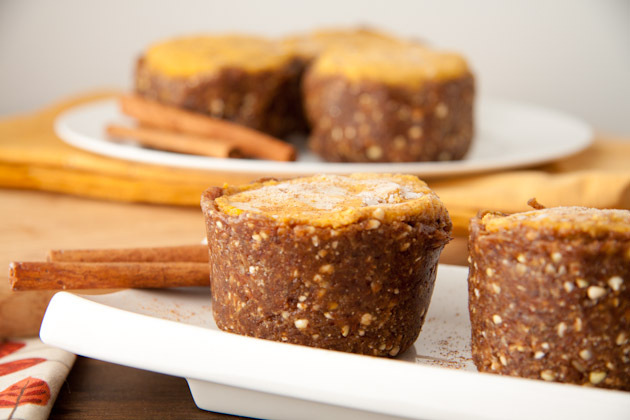 Place pumpkin pie tarts in the freezer for at least 2 hours. Take the tarts out of the freezer 20-30 minutes before serving. -Heat oil in a large Dutch oven or heavy-bottomed pot over medium heat. Once the oil is hot add squash, onion, curry paste, coriander, cumin, salt and red pepper flakes to skillet. Stir to combine. -Cook, stirring occasionally, until onion is translucent, about 8 to 10 minutes. Add broth and cocnut milk. Bring the mixture to a boil, then reduce heat and simmer until squash is soft, about 15 to 20 minutes. -While the soup is cooking, toast the coconut flakes in a medium skillet over medium-low heat, stirring frequently, until fragrant and golden on the edges. Keep an eye on them so they don’t burn. Transfer coconut flakes to a bowl to cool. -Once the squash mixture is done cooking, taste and add a little more Thai red curry paste if it’s not quite flavorful enough for you. Remove the soup from heat and let it cool slightly. Working in batches, transfer the contents pan to a blender or puree with an immersion blender. -Stir the lime juice into the blended soup. Taste and season with additional salt if necessary. Garnish with cilantro. -Course chop the carrots, celery, onion and garlic in the food processor or by hand. -Cut the short ribs into 3 inch medallions. -Coat the short ribs in oil and steak seasoning. -Heat a pan to med/high heat and sear short ribs on all sides. -Place ribs in roasting pan with vegetables, red wine, brown sugar, herbs and water. -Roast in a tightly covered roasting pan or pot for 3 hours. Serve with your favorite side. We love truffle mash or celery root puree.